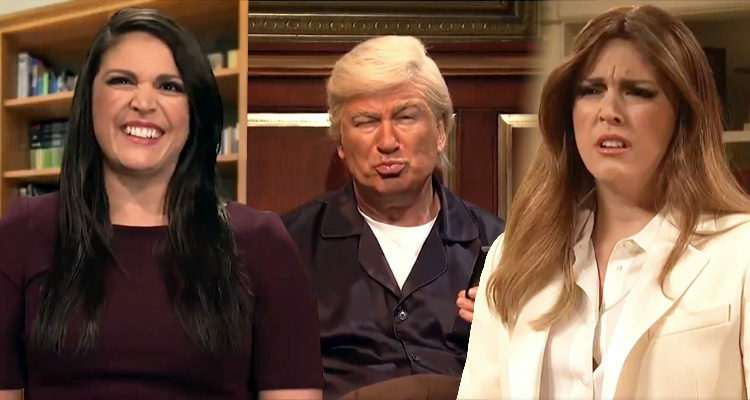 Hilarity ruled the night on SNL as Fox News interviewed Hope Hicks, Melania Trump sought advice from former First Ladies, and Donald Trump got his daily intelligence briefing from Fox & Friends. Alec Baldwin returned to Saturday Night Live this weekend, reprising his role as Trump for the show’s cold open. The sketch began with Trump calling Fox & Friends from his bed. Thanked for taking the time out of his busy schedule to call the show, Trump responded that if he sounded out of breath it was because he was doing his P90X exercises – as he reached for a McDonald’s Egg McMuffin. “Oh, from who?” asked Fox & Friends host Steve Doocy, played by SNL cast member Alex Moffat. “From you guys,” Trump replied. Cecily Strong did double-duty for the show, returning later on to spoof a stressed out First Lady Melania Trump. Natalie Portman, the show’s guest host, appeared as former First Lady Jackie Kennedy as Melania was preparing to attend Trump’s State of the Union Address. Clinton remarked that Michelle’s remarks weren’t helpful, and Jones’ Obama responded, “Whatever, my arms rule, I love vegetables and I can be president whenever I want,” mocking Clinton’s loss to Trump in the 2016 election.